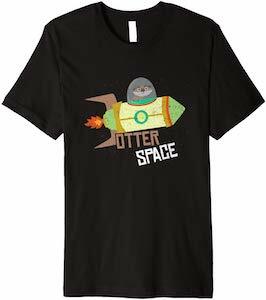 Now you can see that even animals go to space thanks to this otter space t-shirt. This t-shirt is available in styles for men, women, and kids and comes in a wide range of colors and sizes. On this t-shirt you can see a cool spaceship flying through space and if you look inside the spacecraft you can see an otter as the astronaut. Below the flying otter you can find the text “Otter Space” instead of “outer space”. It surely is a fun space and animal t-shirt that both young and old can enjoy wearing as it is so funny. 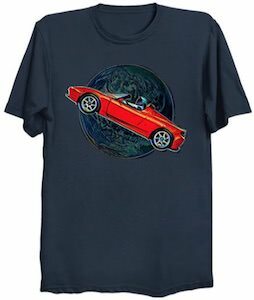 If you liked the new rocket from SpaceX when it was launched and when it delivers the Tesla roadster to space with the Spaceman in it then you are going to like this Spaceman t-shirt. On the t-shirt you can see a planet in the background and in front of it you can see the Tesla car with the astronaut in it just like you can watch live. You can get this t-shirt in styles for men and women and it comes in sizes Small – 6XL and in many colors. So now you can be part of history just to remember the first time a car flew in space. 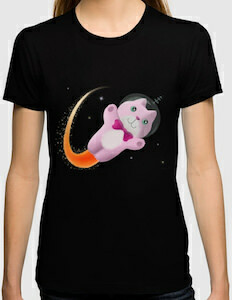 If you like cats in space then this captain space cat t-shirt is what you need. The t-shirt is available in styles for men and women and comes in a wide selection of colors and sizes. On the t-shirt you can see space with stars in the background and on top of that you can find a kitten flying through space like an astronaut on a space walk only this cat seems to have a jetpack or something as it is flying on its own. No need to tell the world you like space and cats because simply wearing this fun t-shirt will get the message out to all your friends. 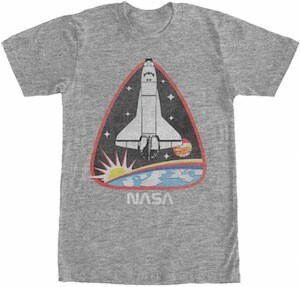 If you like space and space travel then you are going to like this NASA Space Shuttle t-shirt. The t-shirt is light gray in color and is made from 50% cotton and 50% polyester and comes in men’s sizes Small – 3XL. On the t-shirt, you can see a fun shape that reminds me of a guitar pick with a red border and in the shape, you can see the Space Shuttle flying away from earth while the sun over our planet is rising. Below the picture, it has a NASA logo in white so that you know that it is legit and this is an officially licensed NASA t-shirt. Now there is a crazy space adventures t-shirt that offers everything you hope for when you are out in space. The t-shirt is available in many cool styles for both men and women and it also comes in many cool colors and sizes. On the t-shirt, you can see a star filled space and in front of that, you can find spaceships rockets and planets all circling around a big round space base. A space station as amazing as the one on the shirt is something you really and so if you like space and SI-FI then wearing this t-shirt will make you feel amazing. 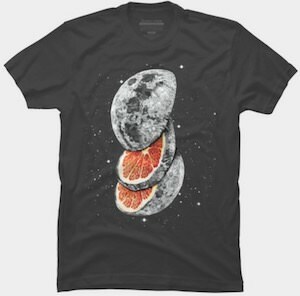 This lunar fruit t-shirt makes you wonder what is really out there. We all know the stories that the moon is made out of choose but this t-shirt makes you wonder what planet are made off. 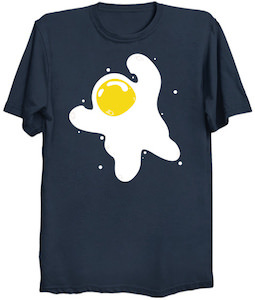 On this t-shirt you can see a planet floating in space and then they cut is in 3 pieces and it seems like that this planet is actually a fruit. It could be an orange but maybe it is a special space fruit. You sure will get attention when you wear this amazing shirt and that is why they make them for men, women, and kids in all kind of sizes, styles, and colors. 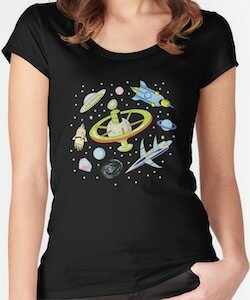 This t-shirt is all about a woman in space and it looks stunning so come check it out. You can get this t-shirt in styles for men, women, and kids and it comes in many colors and sizes and is even available as tank top or sweater. On the shirt, you can see a female astronaut wearing a fitting spacesuit and a helmet that is not connected so let’s hope there is air otherwise she won’t be with us long. 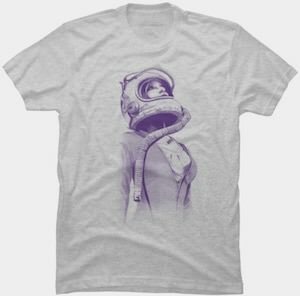 The design of the space woman is just amazing looking and that should be the reason why you like to wear this t-shirt and shows the world. This t-shirt is for people that like baseball and space travel. On the men’s t-shirt, you can see a baseball playing astronaut but this spaceman does not use a ball but instead, he uses a planet or maybe a moon. A different t-shirt like this is just something you should wear as it will make people look twice and smile. 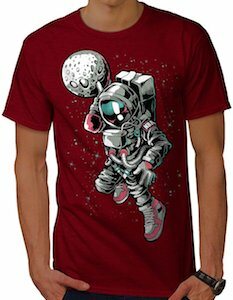 You can get this astronaut t-shirt in size Small – 5XL and all are made from 100% cotton and you can even pick a color like black, gray, blue, white, and red. Show the world that you can play ball in space by wearing this baseball astronaut t-shirt. If you want to go to Mars then maybe SpaceX is able to get your there but maybe starting by wearing this t-shirt could help too. 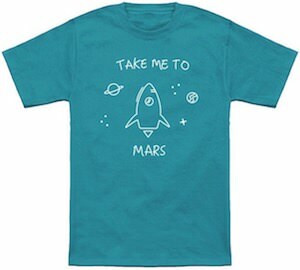 On this t-shirt, you can see a rocket and planets and stars and around all that it says “Take Me To Mars”. Now you just need to find Elon Musk somewhere and wear this t-shirt when you meet him and then if you get lucky he may put you in the next spaceship going to Mars. You can get this take me to Mars t-shirt in men and women’s styles in sizes Small – 6XL and it comes in fun colors too.